Birthright. You are not alone. It feels like you are in the middle of a huge crisis. Your world has turned upside down. What can you do? With an unintended pregnancy, whatever you decide to do will be life changing. So, what do you do? Talk to someone who can answer your questions and provide support while you navigate this crisis. Please join us for our upcoming Birthright Strollerthon. This “fun” fund-raiser is a sponsored 5K walk along the James Bay waterfront, beginning and ending at Fisherman’s Wharf Park, at the corner of St. Lawrence and Michigan Streets. We welcome walkers of all ages and are especially interested in adding more families and young people to our group of walkers. Strollers are optional, but having some babes along for the ride speaks to our theme of support to women dealing with unplanned pregnancy! Sponsor one or more of our walkers. Walkers will be collecting pledges at many of the Catholic parishes in the Victoria area over the next few weeks. They would love to have your support. You can also contact us at info@birthrightvictoria.org to find a walker near you or make a pledge. This year, we have a few holes in our walker line-up, parishes where we’ve had a walker in the past but don’t this year. We need your help to fill these holes. 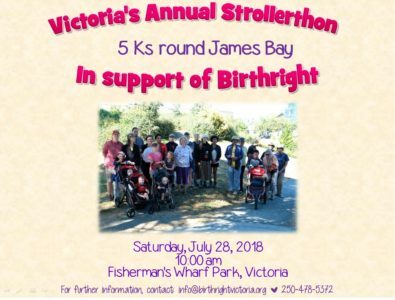 If you attend one of the following parishes and would like to collect pledges and walk in this year’s Birthright Strollerthon, we’d love to hear from you: St Joseph the Worker parish, St. Patrick’s parish in Oak Bay, Our Lady of Fatima parish. But you don’t have to be from one of these parishes to walk in Birthright’s annual Strollerthon. You just have to care about the mission of Birthright Victoria and have an hour or two available on July 28. Sponsor forms, bulletin and pulpit notices, Strollerthon posters…we have all these materials available for you. Please contact us to sign up to walk or for more information. The Walk starts from Fisherman’s Wharf Park at 10 AM, but please show up by 9:45 AM so we can get a group photo before you set off. Contact us at info@birthrightvictoria.org to sign up to walk and get walker materials. Collect pledges from friends, family, & fellow parishioners in the weeks before and after the walk. Another way you can promote Birthright’s Annual Strollerthon is by liking, sharing, or commenting on this post on social media. Birthright Victoria is a non-profit charitable society, providing friendship and support for more than 20 years to women facing unplanned pregnancy. We are part of a larger network with chapters across Canada, the United States, and Africa, as well as a 24/7 North American toll-free Helpline. Birthright is supported by devoted volunteers and private donations.